This report has been produced in respect of The Shipowners’ Mutual Protection and Indemnity Association (Luxembourg) (‘the Club’) to satisfy its public reporting requirements under the Solvency II insurance regulation regime. 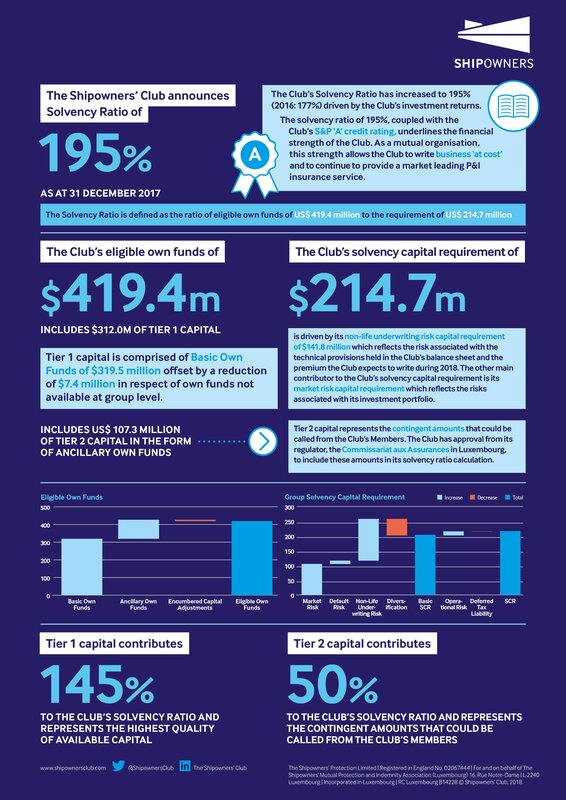 The information contained in this report covers the year ending 31 December 2017. This report has been produced on a single Group basis, a fact which reflects that on a day-to-day basis the Club manages itself as a Group. Where it differs from that of the Group, this report also includes information about the Club on a standalone legal entity basis (‘Solo’) and about Spandilux S.A. (‘Spandilux’), a Luxembourg-domiciled reinsurance subsidiary of the Club. 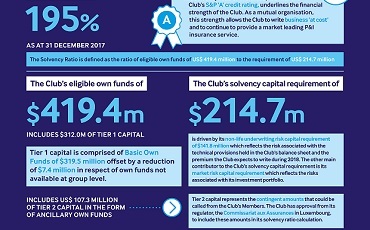 The below infographic provides a summary of the information contained within the Club’s full SFCR.